Contemporary effigy of Dagobert from a gold triens minted at Uzès (1.24g, Monnaie de Paris, labeled "DAGOBERTVS REX". 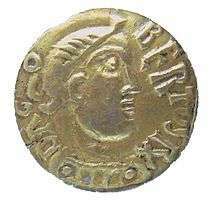 Dagobert I (Latin: Dagobertus; c. 603 – 19 January 639 AD) was the king of Austrasia (623–634), king of all the Franks (629–634), and king of Neustria and Burgundy (629–639). He was the last king of the Merovingian dynasty to wield any real royal power. 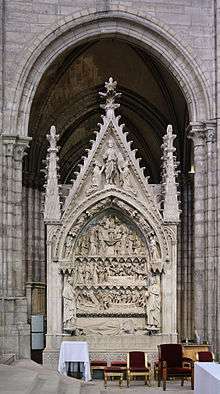 Dagobert was the first of the Frankish kings to be buried in the royal tombs at Saint Denis Basilica. Dagobert was the eldest son of Chlothar II and Haldetrude (575–604). Chlothar had reigned alone over all the Franks since 613. In 623, Chlothar was forced to make Dagobert king of Austrasia by the nobility of that region, who wanted a king of their own. When Chlothar granted Austrasia to Dagobert, he initially excluded Alsace, the Vosges, and the Ardennes, but shortly thereafter the Austrasian nobility forced him to concede these regions to Dagobert. The rule of a Frank from the Austrasian heartland tied Alsace more closely to the Austrasian court. Dagobert created a new duchy (the later Duchy of Alsace) in southwest Austrasia to guard the region from Burgundian or Alemannic encroachments and ambitions. 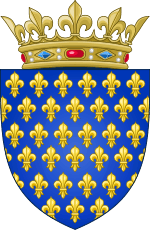 The duchy comprised the Vosges, the Burgundian Gate, and the Transjura. Dagobert made his courtier Gundoin the first duke of this new polity that was to last until the end of the Merovingian dynasty. "Throne of Dagobert", bronze. 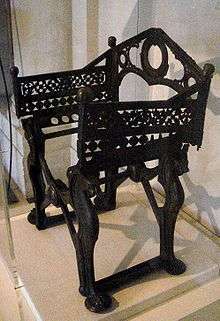 The base, formed by a curule chair, is traditionally attributed to Dagobert, while the arms and the back of the chair were added under Charles the Bald. This throne was last used by Napoleon I in 1804 when he created the Legion d'Honneur. Cabinet des Medailles. Upon the death of his father in 629, Dagobert inherited the Neustrian and Burgundian kingdoms. His half-brother Charibert, son of Sichilde, claimed Neustria but Dagobert opposed him. Brodulf, brother of Sichilde, petitioned Dagobert on behalf of his young nephew, but Dagobert assassinated him and gave the Aquitaine to his own younger sibling. Charibert and his son Chilperic were assassinated in 632. Dagobert had Burgundy and Aquitaine firmly under his rule, becoming the most powerful Merovingian king in many years and the most respected ruler in the West. In 631, Dagobert led three armies against Samo, the ruler of the Slavs, but his Austrasian forces were defeated at Wogastisburg. Also in 632, the nobles of Austrasia revolted under the mayor of the palace, Pepin of Landen. In 634, Dagobert appeased the rebellious nobles by putting his three-year-old son, Sigebert III, on the throne, thereby ceding royal power in the easternmost of his realms, just as his father had done for him eleven years earlier. As king, Dagobert made Paris his capital. During his reign, he built the Altes Schloss in Meersburg (in modern Germany), which today is the oldest inhabited castle in that country. Devoutly religious, Dagobert was also responsible for the construction of the Saint Denis Basilica, at the site of a Benedictine monastery in Paris. He also appointed St. Arbogast bishop of Strasbourg. Dagobert died in the abbey of Saint-Denis and was the first Frankish king to be buried in the Saint Denis Basilica, Paris. The author of the Chronicle of Fredegar criticises the king for his loose morals in having "three queens almost simultaneously, as well as several concubines". The chronicle names the queens, Nanthild and the otherwise obscure Wulfegundis and Berchildis, but none of the concubines, stating that a full list of concubines would be too long. Clovis II (b. 634/5) later king of Neustria and Burgundy. Sigebert III (b. 630/1) later king of Austrasia. It has been speculated that Regintrud, abbess of Nonnberg Abbey, was also a child of Dagobert, although this theory does not fit Regintrud's supposed date of birth between 660 and 665. She married into the Bavarian Agilolfing family (either Theodo, Duke of Bavaria or his son Duke in Salzburg). 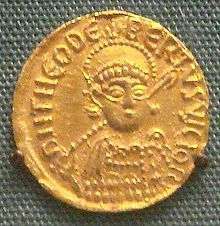 Triens of Dagobert I, Uzès, 629–639, gold 1.24g. Monnaie de Paris. 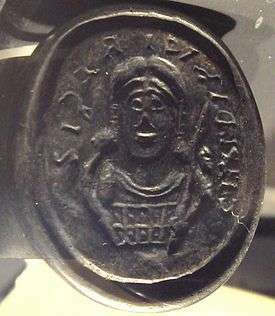 Solidus of Dagobert I, Marseille, 623–629. Cabinet des Médailles. ↑ Arbogast of Strasbourg, Oxford Dictionary of Saints, 5th Edition, Ed.David Hugh Farmer, (Oxford University Press, 2004), 32. ↑ Fredegar IV, 58: Nantechildem unam ex puellis de menisterio matrimonium accipiens reginam sublimavit. Wikimedia Commons has media related to Dagobert I.
Wikisource has the text of the 1911 Encyclopædia Britannica article Dagobert I.